Simply plug the Wireless USB Adapter 300N X2 into your desktop PC or notebook, and you’ll be able to connect this computer to any wireless network. If you have a 300N router and/or other desktop PC’s equipped with 300N technology, you can communicate with them wirelessly at extremely high throughput speeds. The integrated OPS technology enables you to quickly and easily establish a secure wireless network connection with just the push of a button. 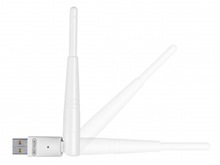 Thanks to the external antenna you can count on optimal wireless coverage. The device is equipped with the rotating connector that guarantees optimal flexibility. Support for Windows 2000, XP, Vista 32/64bit, Win 7 32/64bit.